Whether you choose horror films, thriller novels or theme park rides we all like to frighten ourselves now and again. If you’re looking to build the tension this Halloween, why not delve into the world of classical music where composers are just dying to make you shiver and tremble. Whether it’s a live performance or a movie soundtrack, music can be used to shock and scare us. An orchestra can make us jump with an unexpected blast from the brass section, but sometimes it’s the softly played strings that can be the most menacing as they ramp up the anticipation. 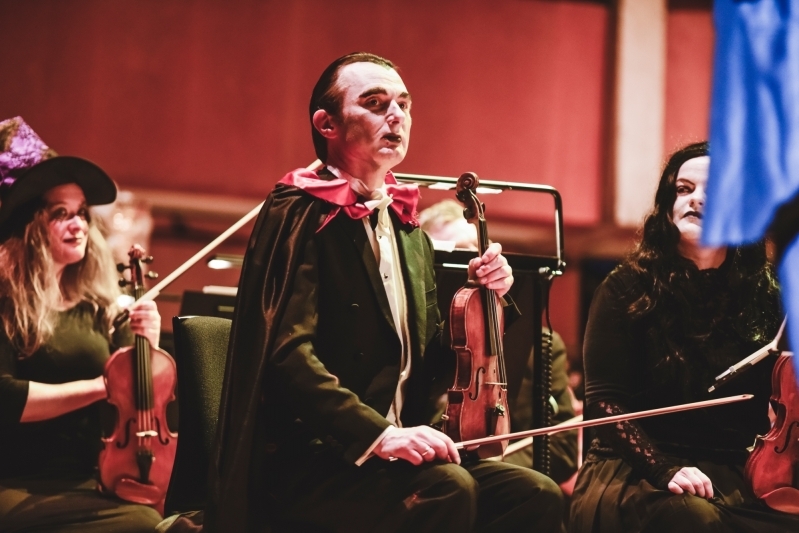 There are so many terrifying examples but we’ve picked some of our favourites to share with you here – you may have heard some of these pieces played at our recent Halloween Family Concert. Hope we didn’t give you nightmares! Hector Berlioz’ Symphonie Fantastique features a range of effects, from the violins using the backs of their bows to create bubbling cauldron sounds in Dream of a Witches’ Sabbath to a single minor-G chord representing the guillotine in March to the Scaffold. This hugely recognisable music is the ultimate in tension-building. Originally composed as incidental music for Grieg’s Peer Gynt Suite it has also been sampled by bands including Pink Floyd and Marillion, featured in the TV series Mad Men and appeared in video games including The Witness. Beginning with its dramatic, instantly recognisable, introduction J S Bach’s Toccata & Fugue in D Minor is foreboding and is right up there in terms of scary music. Used in classic horror films including The Black Cat and Dr Jekyll and Mr Hyde, it’s even featured in Doctor Who. Twentieth century movies also boast incidental music that has become iconic and associated with fear. Some of the most famous examples are John Williams theme from Steven Spielberg’s Jaws which has kept people out of the sea since 1975; Bernard Hermann’s contribution to Hitchcock’s Psychowhich always goes through your head when you take a shower; and not forgetting the adagio from Béla Bartók’s Music for Strings, Percussion and Celesta that featured in Kubrick’s The Shining. If you came to our Spring 2018 season you may have witnessed Don Giovanni being dragged down into hell. The Commendatore scene is dramatic, with music that makes your heart thump as the title character is taken away. Also in WNO’s recent history, Music Director Tomáš Hanus made his debut in 2016 with Mahler’s Resurrection Symphony which famously features the Death Shriek. Maybe add some of these to your own Halloween playlist.